Alternanthera (also known as Joseph's Coat) is a sun-loving annual that is perfect for landscape use. 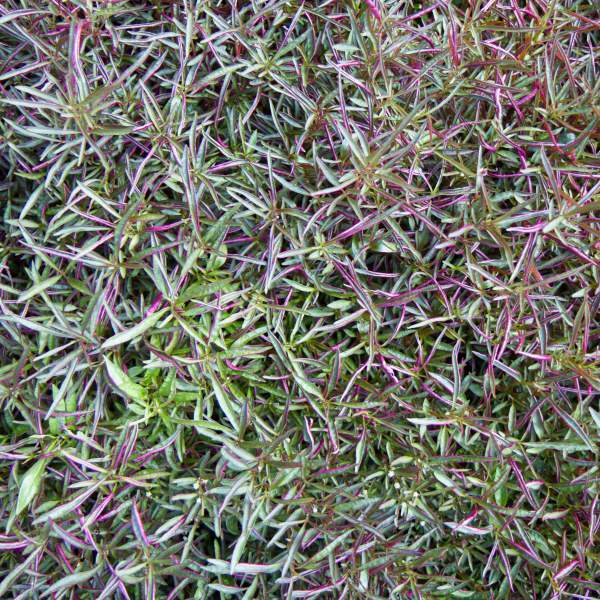 These plants tolerate sun or shade, but they are most colorful in full sun. Alternanthera have a mounding, shrubby habit and grow to a height of 10in-14in. The shorter day length of spring and fall yield richer colors. Red and yellow varieties work well together because they are the same height. To achieve best results with Joseph's Coat, use well-drained soil and plant in full sun. The amount of sunlight on the Alternanthera affects the color of the leaves. We recommend using a constant feed program of 200 ppm N. Maintain a pH between 5.5 - 5.8. Burgundy Thread is a mounding plant and will probably not require pinching. A light pinch might become necessary to shape the plant for your final needs. Joseph’s Coat can be grown pot tight in 1801s or 4 inch pots. While Alternanthera are responsive to plant growth regulators, you usually do not need them because the plants are not prone to stretch and get tall. Whiteflies and possibly aphids are the biggest pest problems with Joseph’s Coat. Burgundy Thread are not prone to many diseases, but watch for botrytis while the days are short. This grey rot is usually associated with wet or humid conditions. You can prevent botrytis by allowing the plant to dry out between waterings, allowing for good airflow in your greenhouse, and spacing to allow the sun to penetrate to the soil level. The most common chemicals used to treat botrytis are Medallion and Banrot. Use them as a drench according to each label’s instructions. We recommend planting 1 starter plant per 4 inch pot or 1801. Use a well-drained soil in your baskets and plant your starter plants deep, allowing the ellepot to be completely covered by the soil. Plant it directly in the middle of your pot.